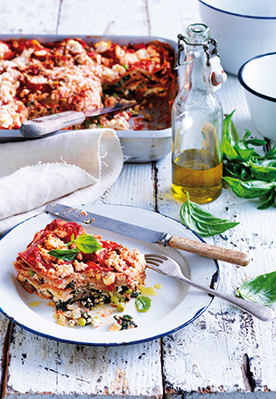 This zippy lasagne packs in the flavour with plenty of green vegetables, layered with tangy but healthy cheat’s béchamel and wholemeal pasta. 1. Heat 1½ tablespoons of the oil in a large frying pan over a medium heat; cook the fennel, garlic, shallots and ground fennel, stirring for eight minutes or until lightly golden. Transfer the mixture to a large bowl; stir in the rind. Season to taste. 2. Wash the spinach leaves but don’t dry. Cook the spinach in the same pan over a high heat, in two batches, until wilted; drain. When cool enough to handle, squeeze out the excess liquid. Coarsely chop the spinach and stir into the fennel mixture. Season to taste. Refrigerate until cooled. Stir in the peas. 3. Preheat the oven to 200°C/400°F. 4. Combine the tomatoes, basil and remaining oil in a bowl and season. 5. Make the ricotta béchamel by whisking the ricotta, eggs, yoghurt, juice and feta in a large bowl until combined. Whisk mineral water into the mixture until combined. 6. Spread one-third of the tomato mixture over the base of a 3 litre (12-cup) baking dish. Cover with one-third of the pasta sheets. Top with half the spinach mixture and half the ricotta béchamel. Continue layering with the remaining pasta sheets, tomato mixture, spinach mixture and ricotta béchamel, finishing with the pasta sheets and tomato mixture. Top with spoonfuls of ricotta. 7. Bake the lasagne for 45 minutes or until the top is golden and the pasta is cooked (cover with greased foil if necessary to prevent overbrowning). Stand for 10 minutes before serving.